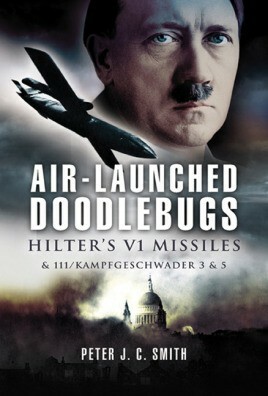 The V 1, or ‘Doodlebug’ or ‘Flying-bomb’ came into use in June 1944 and, together with the V 2 Rocket, was Hitler’s final hope in face of the advancing Allied forces sweeping across Europe towards Germany. Of the 8,000 that were launched within the first 80 days, some 2,300 reached the London area where they caused more death and destruction to its population and buildings. As the front line moved eastwards, many of the ground-based launch ramps became denied to the German forces and the modest range of the missile meant that other means of launching must be considered to continue the threat. An air-launching system, utilizing the Luftwaffe’s Heinkel 111 bomber, was developed and operated by the newly formed Kampfgeschwader units. This posed a dramatic new threat to the UK because the V 1’s effective range was considerably increased and it’s mobile firing point offered a much greater target area when fired from an aircraft flying over the North Sea. This is the story of the development and operation of this new form of attack and also of the Allied reaction and defense-measures taken to minimize damage. Peter Smith is an author and historian.